Demography has developed into a remarkably coherent field and now stands as a firmly established discipline with strong ties to policy-making agencies. However, in recent years there has been increasing recognition within demography of the limits of existing theories and methods, particularly its absence of a strong critical tradition and its isolation from recent theoretical developments in other social sciences. 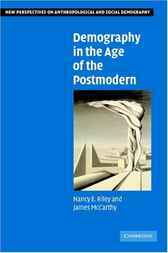 In this study, Nancy Riley and James McCarthy use the lens of postmodernism to structure a critical analysis of the field of demography. Paying particular attention to the fundamental epistemologies and methodologies that currently underlie the field, they explore how postmodern perspectives might serve to energize the field and how demography could be enhanced by the introduction of insights from other social sciences. Drawing on examples of new kinds of research in demography and related fields, this is an important new book that seeks to reinvigorate the field of demography.